Olmoti Primary School provides accessible education from grades 1 through 7, a crucial link for children who otherwise would miss important foundational learning needed to progress at grade level. Olmoti Trust began the school with two classrooms in 2015, and within three years enrolled nearly 300 children in morning and afternoon classes, prompting an expansion to seven grades, with four additional classrooms constructed in 2019. Enrollment has reached 485 students. Maasai men and women are learning to read and write for the first time through our literacy classes. We began the program in 2018 at the request of Maasai men who were gratified to have a school for their children, and now were seeking learning opportunities for themselves. In six months, 80 men and women had enrolled in classes meeting three times a week. 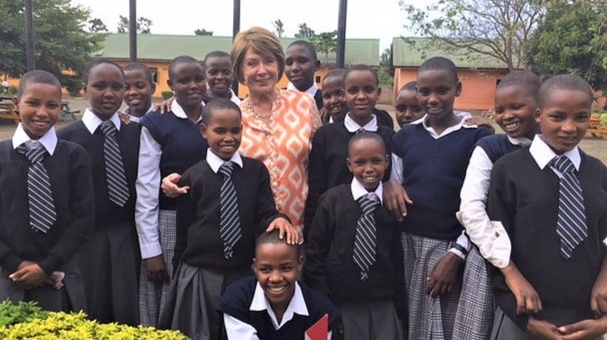 As part of our work to improve the lives of Maasai women, Olmoti Clinic/Our One Community in 2016 launched a sponsorship program enabling local girls to attend MWEDO all-girls secondary school in Arusha. Because they typically are subjected to marriage in their early teens, this education opportunity affords girls a chance to forge a different future, and ultimately transform the Maasai society. Private donations allow us to ensure, through our collaboration with Girl Phenom, this access to otherwise out-of-reach opportunities. Growing enthusiasm for education among the Maasai prompted Olmoti Clinic/Our One Community to begin a program of assistance for boys and girls seeking to attend Tanzanian government high schools and vocational schools. While the fees are modest by Western standards, they are beyond the means of even the motivated Maasai families. In the program’s first year, dozens of families stepped up to send their sons and daughters to high school. To enhance the professionalism and curriculum expertise of our teaching staff, Olmoti Clinic/Our One community collaborates with Silverleaf Academy for teacher training and mentorship. The program involves an intensive training tailored to our school, covering topics such as modern teaching practice and student-centered learning, school leadership, and subject matter such as teaching technology and literacy and numeracy strategies.